Apparently, two types of festivals today use jazz in their name. One is a jazz festival legitimately full with jazz acts. This year’s Chicago Jazz Festival, for instance, stars Kurt Rosenwinkel, Tootie Heath, Terrence Blanchard with Ravi Coltrane, Gary Burton, and Dave Holland with Kevin Eubanks. Each act, without question, is jazz. Then there’s the event with jazz in its name which sports a token jazz act surrounded by other, presumably more popular, genres of music. The Capital Jazz Festival, situated between Washington D.C. and Baltimore, is an example. This year, Dianne Reeves shared the billing with Chaka Khan, Erykah Badu, John Legend, Peabo Bryson and The O’Jays. I’m not sure why an event like that is branded a jazz festival. Perhaps it’s a legacy title, recalling a day when its schedule was dominated by jazz. Or maybe it’s because the event is located in a jazz district. That would explain the 2014 Kansas City’s 18th and Vine Jazz and Blues Festival. 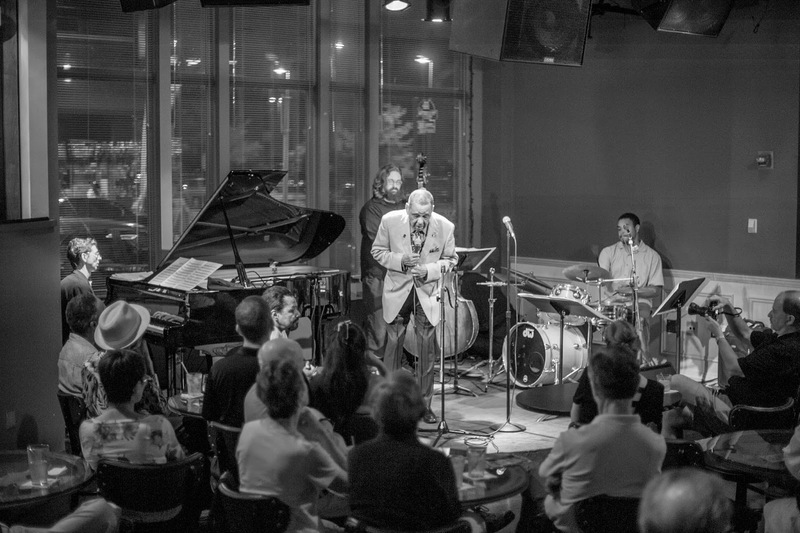 Let’s state upfront: Organizers at the American Jazz Museum stage a first class event. Last year cut a few corners compared to previous years, such as less and less elegant signage. But the museum still mounted an outstanding music festival, complemented with a variety of vendors, tight staging, a good flow through the grounds, and deep respect for visitors once you’re inside the festival (but not when you’re trying to find a parking space; unless you’re an organizer or a sponsor who paid oodles, parking is a problem). But whatever you name it, this is a music festival, not any more a jazz festival than one starring Chaka Khan and the O’Jays. Look at the announced headliners. Trumpeter Roy Hargrove is the event’s legitimate connection to jazz. But the festival’s website does everything possible to downplay that connection. It says, “Ever stretching into more challenging and colorful ways to flex his musical chops, Hargrove has left indelible imprints in a vast array of artful settings. In 2003, he introduced his own hip hop/jazz collective The RH Factor….” And it quotes Hargrove as musing, “I’ve been doing more touring with RH Factor than my quintet lately….” It doesn’t state whether he’s coming with his quintet or his don’t-worry-everybody-it-doesn’t-really-sound-like-jazz group. Headliner Meshell Ndegeocello is described by the festival’s website “as a redeemer of soul music. Her music incorporates funk, soul, hip-hop, reggae, rock and jazz.” I listened to some of it on iTunes. The jazz influence is exceptionally well hidden. The festival site makes no pretense at all of tying headliner Midnight Star to jazz. Good thing. I’d never heard of them. After listening to their Greatest Hits album on iTunes, I never want to hear them again. You will if you like 1980s vintage electronic dance music. Finally, headliner Lucky Peterson fills the blues portion of the festival’s lengthy title as, frankly, the act I’m most looking forward to hearing. With a modern groove laid down on a true down-n-dirty blues sound and the occasional boogie, this music is authentic. Maybe authentic enough to scare off everyone the other acts seem aimed at attracting. I understand the expense involved with staging an outdoor festival. I understand the need to attract more people than attend a concert at The Gem or spend a night in The Blue Room. But I also understand the message being sent implies a fear of jazz. The American Jazz Museum is staging a music festival that tries to associate itself with jazz though its name but disassociate itself through the actual music. This appears to be a festival booked with marketing in mind, by defining an age group who organizers think will buy tickets to a music event at 18th and Vine and booking the acts they can afford with the broadest appeal to that defined group. I work in marketing. I deal daily with research and target marketing. It’s a fine, science-based method for building campaigns designed to move merchandise to consumers or for driving business-to-business sales. I hate art defined by marketing. Especially when I know organizers don’t need to fear jazz. You see a comparable mentality to the Corporate Woods Jazz Festival. I haven’t decided yet whether that event’s decision this year to book Bobby Watson, Eldar and Angela Hagenbach in half hour segments was a misguided experiment or booking by someone who doesn’t have a clue. Legitimate jazz names properly selected, correctly marketed – that’s critical – and fairly priced will draw people to an outdoor music festival. You need to sell the event. You need to sell the experience. You need to sell the idea that if you miss this, you’ll miss what everyone in the office will be discussing on Monday morning. There’s where research-based marketing benefits an arts event: In knowing how to sell it. And that’s where you set a festival apart from, say, a jazz concert at the Folly marketed with a few ads in the Sunday Star. I remember in the early 1980s, at an 18th and Vine Jazz and Heritage Festival, hearing Eddie “Lockjaw” Davis and Harry “Sweets” Edison perform with Rich Hill’s trio in Eblon, a club then at the corner of 18th and Vine where Danny’s Big Easy stands today. A small stage was set up because rain had forced the outdoor tents to come down. And as “Lockjaw” blew an unforgettable solo, the noisy club quieted, every conversation stopped, and the audience listened. We were hearing musical magic. The 2014 equivalent of an act like that should be playing a music festival at 18th and Vine. Properly marketed, it will draw a crowd. It will just be a different crowd than comes to hear 1980s vintage electronic dance music. Two festivals bookended the month back then, the 18th and Vine Jazz and Heritage Festival early in August and the Kansas City Jazz Festival late in the month. Conveniently, both Count Basie’s and Charlie Parker’s birthdays fell during the month. Saks Fifth Avenue, then on The Plaza, hosted a classy jazz awards celebration on a Friday night. Other special events popped up from year to year. So, in the latter half of the 1980s, the Kansas City Jazz Commission obtained proclamations from the Mayor’s office and from the Missouri Secretary of State – they were easy to get if you submitted the parts about your event written in their style – naming August as Jazz and Heritage Month in Kansas City and Missouri. The Kansas City Jazz Festival eventually merged with the blues festival and moved to July. The 18th and Vine event moved into September. Saks ended the awards celebrations. And the Jazz Commission stopped asking for August proclamations. This August may be time for somebody to ask again. 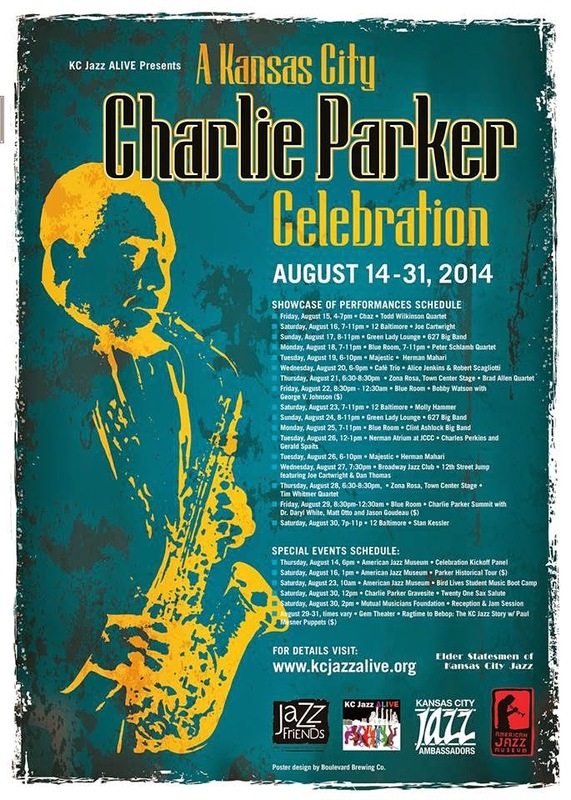 KC Jazz ALIVE, with its freshly-acquired not-for-profit status, has branded a compilation of events as an 18-day Kansas City Charlie Parker Celebration. It mostly promotes already-scheduled-with-no-idea-they’d-wind-up-being-connected-to-Charlie-Parker club dates. But give credit where it’s due. This is an inaugural effort to recognize one of the greatest icons in jazz history, in the city where he was born and raised, a city which until now couldn’t even see the benefit in saving his home or put the right saxophone on his tombstone. From August 14th through the end of the month, over 18 days, KC Jazz ALIVE will promote the collection of concerts and events as recognition of one of this city’s most culturally important sons, even reviving the Twenty One Sax Salute at Parker’s gravesite at noon on August 30th. Boulevard Brewing has designed an impressive poster. The 1983 revival of the Kansas City Jazz Festival was a two week collection of events under a single banner. So was the 1984 festival. This format has worked before in Kansas City. It has the potential to bring welcome attention to Kansas City jazz while honoring a legend who should have been honored decades ago. Unassociated with the Parker celebration but falling within its 18 days is an August 23rd unveiling of a new American Jazz Walk of Fame along 18th Street, between Vine and Highland. Six bronze medallions will be embedded in the sidewalk honoring Count Basie, Mary Lou Williams, Jay McShann, Bobby Watson, Pat Metheny and, of course, Charlie Parker. Sounds much like the bronze stars that once faced a hotel on 12th Street. A concert by the Count Basie Orchestra in the Gem Theater will cap the event. It’s all organized by the Jazz District Renaissance Corporation (though word on the street largely places the office of Rep. Emanuel Cleaver behind the effort). 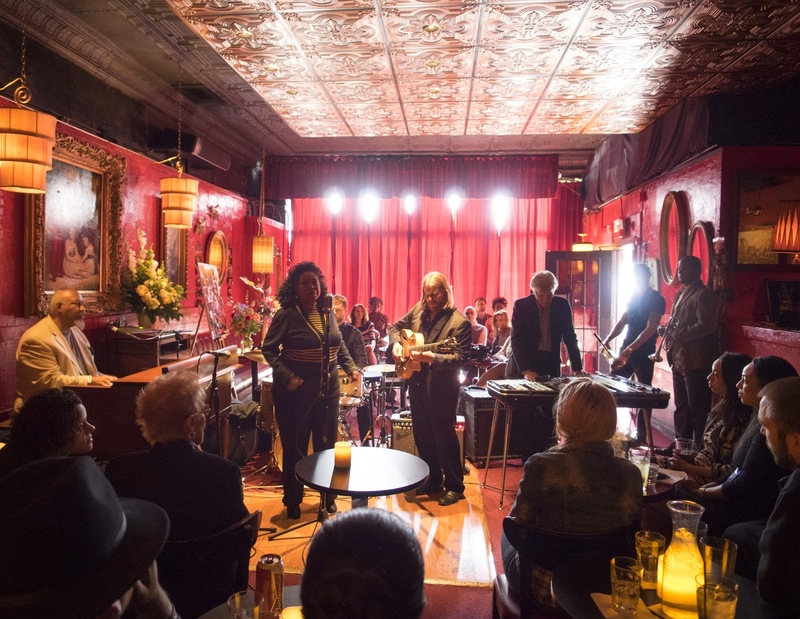 Last year saw the renovation of homes and the Rochester Hotel along Highland Street, finally surrounding the Mutual Musicians Foundation with the inviting environment it needed and deserved. These medallions will bring renewed focus to 18th Street. It’s good to see architectural enhancements spread throughout the district. Next year, another event or compilation celebration highlighting dates early in the month could again warrant a proclamation honoring the month both Charlie Parker and Count Basie were born. KC Jazz ALIVE is on a roll. Their program at the Folly Theater to introduce musicians to opportunities to earn a living resulted in some musicians taking jobs that will allow them to make money and perform. Some argue that artists should be able to earn their living as artists. And some artists do. But even Jay McShann drove a garbage truck to support his family. Whether we’re talking jazz saxophonists or poets or portrait painters, the reality today is that only the best of the best artists find full time employment in their art, and even then only those who understand how to successfully sell and market themselves. KC Jazz Alive’s next step will be to help jazz musicians do just that, setting up a chance for promotional photos. The American Jazz Museum is also on a roll. They’re one of the key organizations behind the Charlie Parker Celebration. On Wednesday they will officially unveil the lineup for October 11th’s Kansas City’s 18th and Vine Jazz and Blues Festival (will someone slice and dice that name into something manageable? ), even though if you follow the right orgs on Facebook, you’ve already seen all of the headliners’ names. And on top of a successful PEER fundraising effort (noted here), they have won a $133,050 grant from the Institute of Museum and Library Services to add staff to improve collections accessibility. Think easier access to the John Baker jazz film collection in the near future. 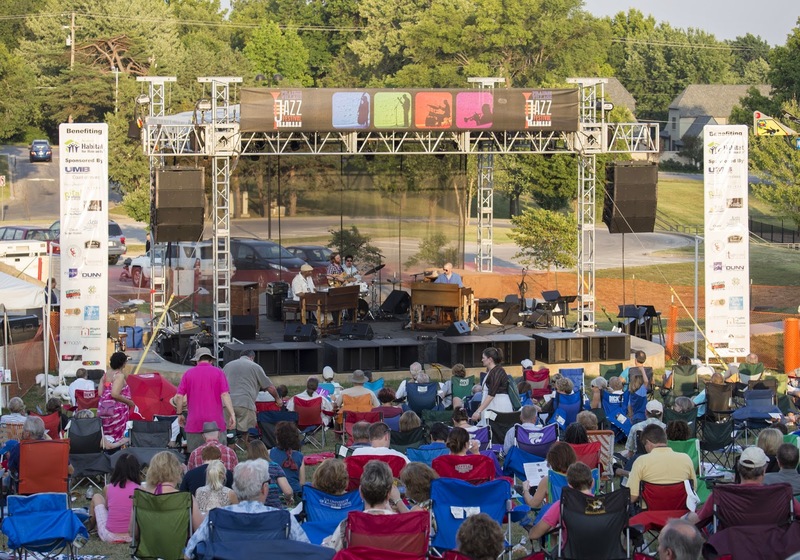 The organizers of The Prairie Village Jazz Festival require each act to have a connection to Kansas City (you smooth jazz acts who want to return here can stop emailing me. Having played the Corporate Woods Jazz Festival is not a connection to Kansas City). The music needs to be dynamic to play well to a large space. Intimate jazz has its place, but an outdoor hill seating thousands of people isn’t it. That doesn’t mean only music that’s brassy and bold need apply (though it can). It means jazz that’s accessible and makes an emotional connection with the families who fill that hill. This isn’t about giving an audience what some snide know-it-all decides is good for them. This is about giving a husband and wife in tee-shirts and shorts and laying on a blanket, jazz they’ll enjoy. Last year’s festival lost money, and the talent budget was the place to cut. I decided we would not pursue a big band. Last year’s festival showed me we really need a bigger stage to properly accommodate a big band. Between the number of musicians to be paid and increased production costs associated with a larger stage, this wasn’t to be a big band year. With the abundance of extraordinary jazz talent in Kansas City, and slots for just six acts during the festival day, I wanted to largely consider musicians who were not in last year’s event. That goal influenced decisions on the groups to invite. And I wanted a link to the jazz district. I’m still stung by memories of The Kansas City Jazz Festival, which I helped organize through much of the 1980s, being contrasted with the 18th and Vine Jazz and Heritage Festival staged those same years. Some back then decided this city had a white jazz festival and a black jazz festival. With a significant festival in the 18th and Vine district five weeks after the Prairie Village event, we need a connection, not a perception of indifference and division. Scheduling begins with the headliners, and I knew where I wanted to start. Anyone who has heard Deborah Brown knows her voice is one of the most magnificent in jazz today. But she rarely plays Kansas City, her hometown. Her extraordinary talent is better known in Europe, Asia and Russia, where she performs much of the year. Deborah should be recognized here. My goal: At the conclusion of this year’s festival, thousands of fans ask why they had never heard of Deborah Brown before and where can they hear her again. Maybe we’ll meet that goal, maybe not. But I decided we’d try. I asked Deborah to put together a headline group. She did. Joe Lovano was Downbeat’s Tenor Saxophonist of the Year last year, and their Jazz Musician of the Year in 2010. And he and Deborah have known each other for decades. She added Terell Stafford, whose trumpet dominated The Blue Room when he played there with Bobby Watson and Horizon a few months back. This will be pianist Richard Johnson’s second trip to the festival. He played with Bobby Watson’s quartet a couple years ago. Any jazz fan recognizes the potential of that group. But we also needed a name the public at large might better know. Kevin Mahogany, who is always delighted to return to his hometown and to sing with Joe Cartwright’s trio, was available. For the second year running, a show seen at Take Five influenced a selection. Last year, it was opener Andy McGhie. Earlier this year, when I heard Shay Estes’s quartet with Matt Otto and Rod Fleeman added, I heard a new dimension in her music. They were in. For the third consecutive year, we open with an ensemble of this city’s younger jazz generation. Ryan Heinlein’s Project H has just recorded a new CD. Last year, the Mutual Musicians Foundation All-Stars was a fortunate last minute addition. I recognized the importance of connecting with 18th and Vine. This year, the Jazz Disciples, a Blue Room regular, connects. Last year, Everette DeVan and Chris Hazelton roused the crowd just before the headliners. This year, Bram Wijnands Swingtet will play the crowd rouser. A formula has evolved over the last few years, of a certain flow of jazz groups that works playing to that hill. And if each of this year’s groups has one thing in common – besides the fact they play jazz – it’s this: These are ensembles whose music and personalities will make an emotional connection with the crowd. 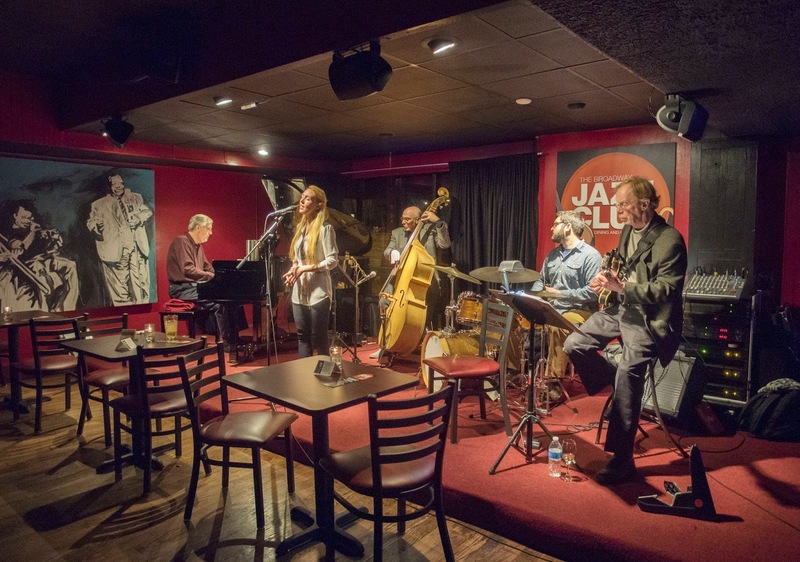 From the award-winning Blue Room to the living room intimacy of Take Five to the funky eclecticism of the Green Lady Lounge, Kansas City today hosts a variety of jazz clubs, each wearing a unique identity. Any KC jazz fan knows this. But it became even more obvious while scrolling through a few years of photos, looking for ones that showcase each location's feel, for possible use on a new website. Typically, photos in this blog feature the musicians. Today, we admire the venues. Not every locale is represented. I’ve yet to carry the camera into The Ship, for instance, which recently opened to everyone in the West Bottoms and is a one-of-a-kind experience. 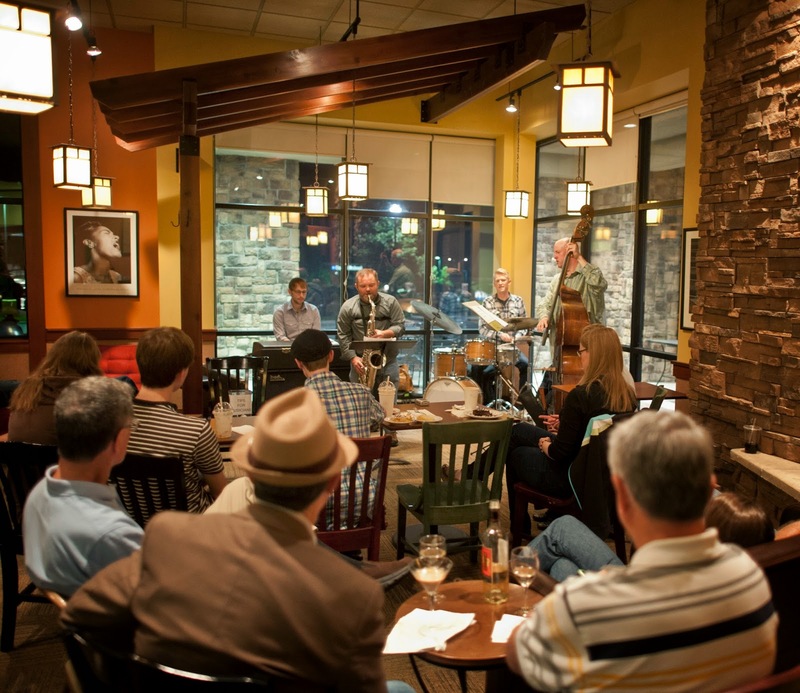 But below is a sampling of the environments where you’ll find jazz in Kansas City in 2014. Upstairs at the Green Lady Lounge. I’ve yet to photograph the recently renovated downstairs Orion Room. Red walls, apparently, are in with Kansas City jazz clubs today. 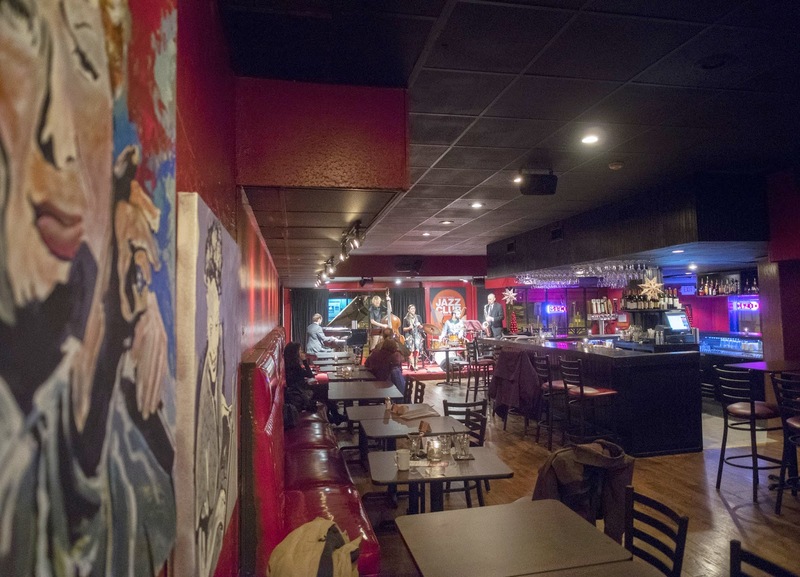 So are paintings of KC jazz icons at the Broadway Jazz club. You’d never have convinced me that jazz would work in Johnson County until Take Five proved it. Actually, they have more than proved it. Soon Take Five will be moving into double the space. 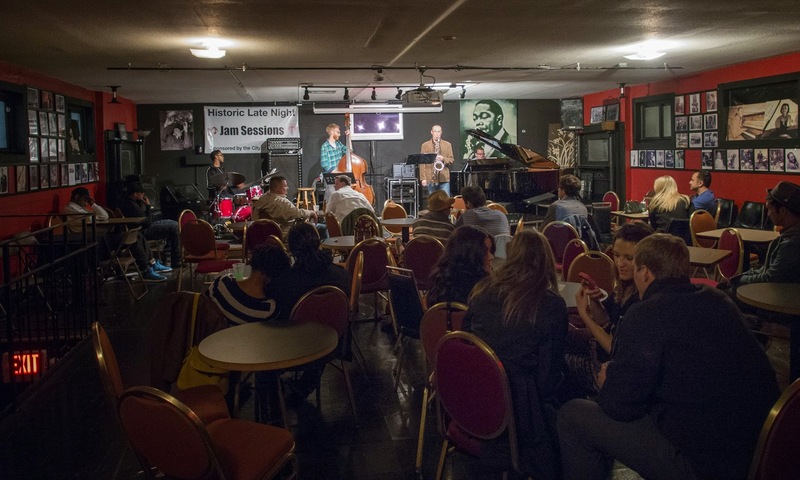 Don’t overlook the late night weekend jam sessions at the Mutual Musicians Foundation. We have festivals. 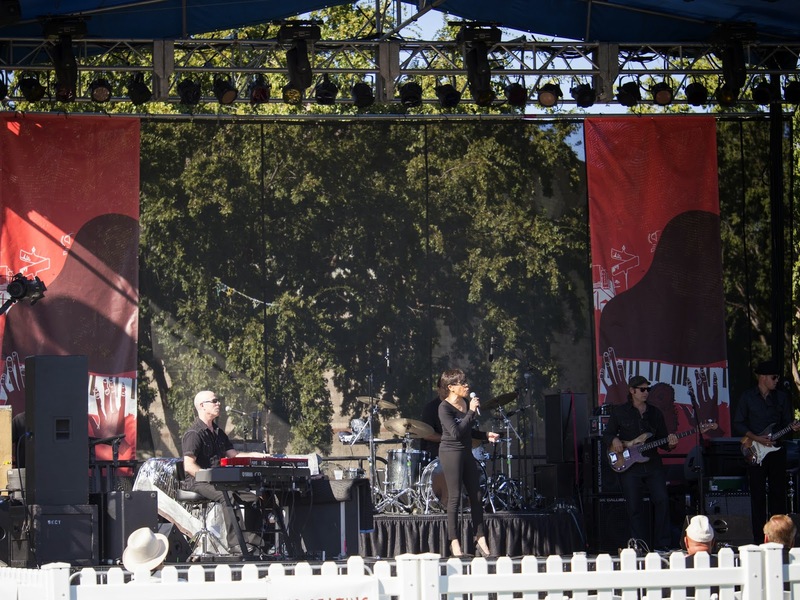 Such as when Bettye Lavette took over the stage at last year's Kansas City 18th and Vine Jazz and Blues Festival. Or when crowds started to fill the park for the Prairie Village Jazz Festival. January’s Jazz Winterlude at Johnson County Community College will take next year off. But here’s proof it has filled Yardley Hall. A closer look at the stage at the Broadway Jazz Club.